No, this isn't sushi, but I'll get to that in a minute. First, let's take a moment to pay homage to ochazuke, the ultimate in Japanese comfort food: a simple, heart- and stomach-warming rice soup. 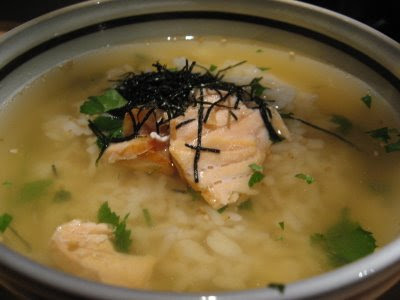 In the typical Japanese home, ochazuke is a way to finish a meal, or to enjoy leftover rice the next day: you simply throw rice and whatever else you want for garnish and flavor (typically nori seaweed flakes, sesame seeds and pickled plum; ideally pieces of broiled salted salmon, too) into a medium-sized bowl. Then you pour tea over it, give it a light stir, and slurp. Ahhhhhh ... warm and yet sorta refreshing. The ochazuke pictured here, however, is a more "upscale" version, served at Sushi Murasaki, a true gem of a Japanese eatery in Santa Ana, just up the street from where I grew up. The ochazuke here is made with a light fish broth, and as you can see, topped with high-grade salmon and some delicate greens. All this for only about $5. Comparatively, a typical homemade version costs less than $1, but the Murasaki ochazuke is a steal when you consider the quality of ingredients and the satisfaction you get from consuming it. Overall, Murasaki ("purple" in Japanese) is a true gourmet bargain. The prices aren't exactly cheap, but it's not overpriced like other places that offer far inferior sushi and sashimi. The sashimi here is varied and presented beautifully, with unusual garnishes (including yuzu and truffle oil) applied with a subtle, perfect touch. The restaurant is a cozy place, located in an office complex, with maybe 10 tables max, plus a handful of seats at the sushi bar. It's genuine Japanese style and mood, quiet and minimalist in decor, with a mostly Japanese clientele (many of whom were regulars at Inaba, which formerly occupied the space and specialized in handmade soba noodles). Read my friend and fellow foodie Kat's review of Murasaki at Food Frenzy. I was with her on this visit, and I introduced her and another friend, Jenn, to the joys of lesser-known foods like yamakake (grated mountain potato) and ochazuke. You'll see they were instantly hooked.